snakebyte are well known for their awesome video game products for the PS4, Xbox One, Switch, PC and even Android phones. Here’s something you might not know about snakebyte, they also have a really good gaming chair too that I had the chance to check out for a product review here on ThisGenGaming. I’m going to be going over the set up of the chair, the design, and finally the overall value of the chair. I’m going to start with the set up of the snakebyte Gaming:Seat. The set up part of my gaming chair reviews are always the most important part as there’s nothing worse than a gaming chair that is difficult and annoying to set up! Anyone who purchases a gaming chair is hoping it’s easy and stress-free as possible, and thankfully that can be said for the snakebyte Gaming:Seat. The set up of the chair took around 30 minutes, and the chair was very simple to put together with no issues whatsoever during the set up of the chair. The instructions were easy to follow, and at no point did I feel like this was difficult at all to do. 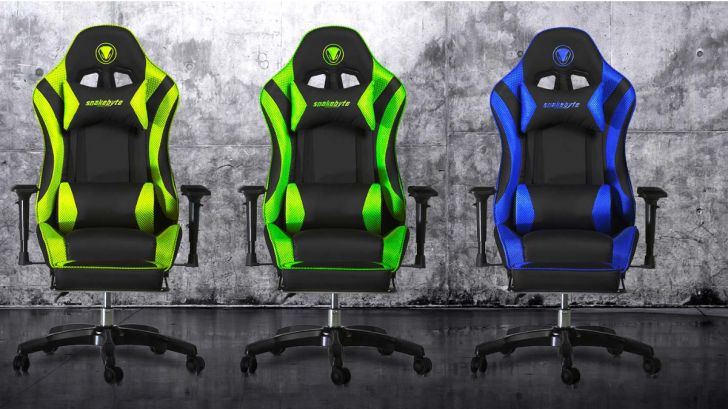 This shows that you are getting a quality gaming chair that has been very well, and also has the customer in mind. The snakebyte Gaming:Seat is very well designed, and would stand out in any gaming set up that you have in your home. It follows the very popular trend of being a gaming chair that follows the design of a racing chair. The chair also has something that I’ve not seen in any other gaming chair that I’ve ever reviewed. It includes an adjustable foot rest which I didn’t know I needed so badly on a gaming chair! Long gaming sessions are now as comfortable as ever with this amazing addition. The backrest is also fully reclinable so you can find your perfect combination of both the foot rest and back rest for those gaming sessions! As for the overall comfort of the chair, I found it to be very comfortable after these gaming sessions. It’s always hard to find the perfect gaming chair for comfort, and I think snakebyte is up there as one of the most comfortable gaming chairs that I’ve ever reviewed. It includes two pillows for your neck and back for that extra bit of comfort. At around £229.99, I think the snakebyte Gaming:Seat is very fairly priced as a premium gaming chair for all the serious gamers out there who are going to need a really comfortable gaming chair for those long sessions. It also has the foot rest included as a part of the chair which is something not many other gaming chairs are doing with some making you pay extra for the foot rest! It’s designed very well, and it’s a great looking chair. If you have a little extra in the budget then I would say it’s worth paying that bit extra for a serious gaming chair that is up there as one of the best! You pay a premium price for a premium product. Overall I was very impressed with snakebytes gaming chair, I’ve been a big fan of their gaming products over the years, and their quality has transferred over to gaming chairs. The set up of the chair was simple to do, easy to follow, and it was up and ready to use in no more than 30 minutes. I’m giving this chair my stamp of approval, and highly recommend that you purchase it!